This regional workshop will bring together participants from African countries that currently implement Program-for-Results (PforR) operations and those who are considering this financing instrument. Government officials, representatives of multilateral and bilateral donor agencies, civil society organizations and operational practitioners from the World Bank will discuss recent accomplishments and challenges in PforR. They will share lessons and build on each other’s practical experiences. 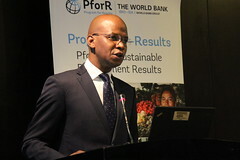 Tanzania: Mr. Gerald Mweli, Acting Director of Policy and Planning, Ministry of Education and Vocational Training.